You are currently browsing the category archive for the ‘Economic collapse’ category. A quarter of U.S. families feel they are under economic stress due to the aftershock of the Great Recession and most do not expect their wages to increase in the next year…. 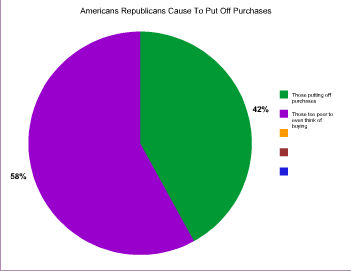 42 percent of respondents said they had delayed major purchases due to the Republicans creating havoc. 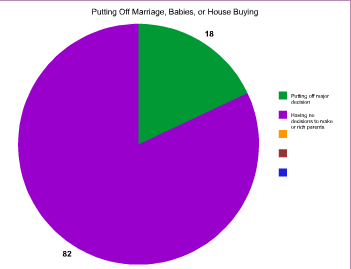 18 percent saying they put off a major life decision, including buying a home or getting married, due to the crisis. Three-fourths of households said they expected their incomes to be the same or lower over the next year. 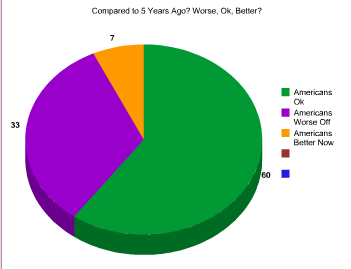 A third said they were “somewhat worse off or much worse off financially than they had been five years ago. Graphs Home Made/ Figures from Reports on Economic Well Being of American Households as reported by Reuters. This economic demise was all brought about by unregulated derivatives. a Republican creation which was purposefully excluded from any regulation whatsoever… It was caused by making government smaller, by cutting watchdog agencies, by passing laws excluding certain shady practices from being under the scope of the law, and of course, by giving the very wealthy huge tax cuts which were spent on everything other than creating jobs here in America. You must vote this November. You must not vote for a Republican…. 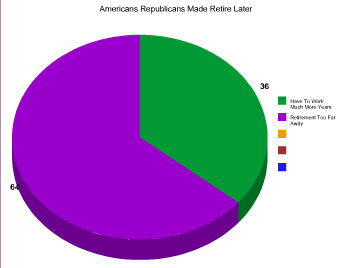 These dismal graphs would all be positive now, if the bipartisan bills passed by the Senate, had simply been allowed to come to a vote in the Tea Party House…. Draw your own conclusions, but the only one smart people can come up with, is that driving the car with the emergency brake always on full, gets America nowhere…. I’m sure most of you have played Monopoly. With several people playing it is fun for a while.. After a point it stops being fun, and you just hang in. After another point, those people who have left the game seem to be having more fun than you and your competitor. Finally one of you goes bankrupt…. The American economy is the same way. While people think they have an opportunity to get better, the playing is fun. As long as they believe everyone can win, the play by play is mesmerizing. Hope is missing from today’s economy. Most Americans have been shut out of the game… They are on the sidelines binge watching Netflicks’ episodes… Fewer and fewer players are left making riskier and riskier moves. Basically, eliminate Republicans, and the game is fun, again. It’s been six months since the greatest debacle ever experienced by a civilized human being, has taken place…. The Republican Party of the United States of America,fully endorsed by Charlie Copeland here in good old Delaware, shut down the Federal government over the repeal of Obamacare . Only those close to the story knew over what they were protesting…. B. They didn’t want 315 million Americans to benefit from new requirements forcing insurance companies tospend at least 80% of our premium dollars on our health care , or refund us back our money…..
D. They didn’t want 315 million Americans to benefit from knowing that our insurance can now never be capped or canceled at the whim of insurance companies. E. They didn’t want 105 million Americans to no longer have lifetime expense caps, either through chronic disease, or corporate restrictions. F. They didn’t want depending on which survey you read, 50 to 129 million Americans to benefit from the Obamacare provision that eliminates all bars for coverage based on pre-existing conditions..
G. They didn’t want those 49.4 million American current Medicare enrollees to under Obamacare now feel secure knowing that existing Medicare benefits can neither be reduced nor taken away. H. They didn’t want 6.1 million Americans with Medicare Part D to no longer have to go through the “doughnut hole” coverage gap. I. They didn’t want 4.4 million low-income adults to now have access to health insurance thanks to states implementing the expansion of Medicaid under Obamacare…. K. They didn’t want 3.1 million of America’s young adults to get coverage because of the provision in Obamacare that allows them to stay on their parents’ insurance plans until age 26…. They wanted none of the above… When like a terrible two year old, they couldn’t get their way, they furloughed 700,000 Americans for a combined total of 6.6 million days, shut down the National Parks and Monuments thereby damaging local communities, closed down the NIH and CDC, stymied essential permits and necessary reviews, stopped import and export licenses thereby freezing trade, froze all Federal money earmarked for small businesses, homeowners, and families in rural communities, disrupted loans because banks and lenders could not access the Federal database, delayed $4 billion in tax refunds to American consumers, prevented all food and water from being inspected, prevented all train and plane accidents from being inspected, stopped critical defense and other non defense research, and cost 120,000 jobs from being created those two weeks in October….. It was just 6 months ago…. All of that…. just so you would not receive any of the above benefits from Obamacare….Oh, my, tsk, tsk. This is election year… Still not fired up? So what’s your real reason? Got rocks in your head? Last December I’d stumbled across this interactive map put up by the PEW foundation, which had accumulated each state’s research of how many people were unemployed long termed back then, and how many were slipping off the roles this upcoming year… What I want to show, is the economic consequences of not continuing unemployment benefits, and to show it on a state by state basis. The economic cost is nothing to ignore….As you may remember, Walmart is reeling from the food stamps (SNAP) cutbacks last November. Their figures for this quarter come out early April. But having some of their biggest clients drop out of society’s economics, jolted them last quarter.. The numbers for my state were estimated lower than reality.. PEW underestimated in December what Delaware actually reported in January by about 10%… Therefore these numbers should be considered baseline conservative estimates only, and very believable.. If they shock you, the reality is probably much worse…. The idea occurred to me (and I did a piece on my own state), that we could figure the economic damage relatively easily by finding the number of unemployed, calculating their economic worth by extending the average check amount, and applying a multiplier to account for the increase economic activity that unemployment creates. These multipliers are all over the map. The Dept of Labor predicts a 2.0 multiplier. and Moody’s predicts a 1.55 multiplier… Every dollar given through unemployment, creates $2.00 (1.55) in overall economic benefit as it continues to filter up the economic ladder to the top…. Arkansas 9,300 lost benefits on Dec 28th. 775 added each week. Total off roles as of March 1st = 16,275 @ $ 451 Arkansas benefit = now hitting with an impact of $ 7.3 million per week.. March 1st -Dec.28th cumulative Lost Income Damage = $57.6 million times 1.55 Multiplier effect $89,39,018 dollars. California 214,800 lost benefits on Dec 28th. 16,078 added each week. Total off roles as of March 1st = 359,502 @ $ 450 California benefit = now hitting with an impact of $161 million per week.. March 1st -Dec.28th cumulative Lost Income Damage = $1.29 billion times 1.55 Multiplier effect $ 2,002,878,225 dollars. Colorado 17,900 lost benefits on Dec 28th. 1400 added each week. Total off roles as of March 1st = 30,500 @ $ 466 Colorado benefit = now hitting with an impact of $14.2 million per week.. March 1st -Dec.28th cumulative Lost Income Damage = $37.7 million times 1.55 Multiplier effect $ 58,434,070 dollars. Connecticut 26,000 lost benefits on Dec 28th. 1636 added each week. Total off roles as of March 1st = 35816 @ $ 665 Connecticut benefit = now hitting with an impact of $23.8 million per week.. March 1st -Dec.28th cumulative Lost Income Damage = $221.8 million times 1.55 Multiplier effect $ 343,878,815 dollars. One in 5 children across America or 21.8%, live like that. (More than a majority of Americans (58.5%) will spend at least one year below the poverty line at some point between ages 25 and 75.).. The ratio is one in five. In a class of 10, two students will be attending from a home under poverty. In a class of 20, four students will come from families living in poverty. Below is childhood poverty tracked across 53 years starting in 1959. 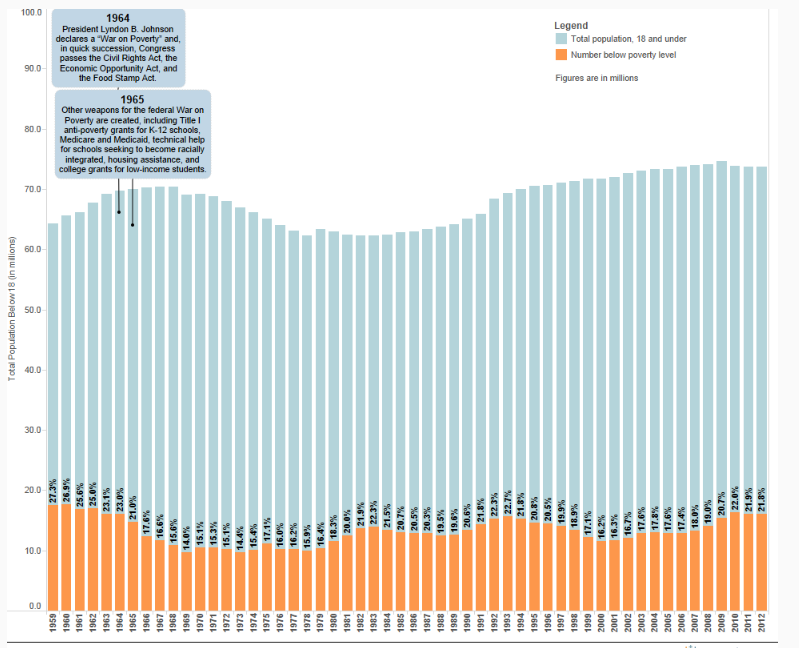 Whatever we did from 1965 to 1979, we need to do again… See the low dip on the chart? Our current high level of poverty is very near the record, with one major exception. Unlike all other peaks we have plateaued at this bubble’s highest amount. Notice how in 1993 and 1983, the same levels were reached under those two presidents, but quickly descended thereafter? Since the election of the Tea Party Republicans to Congress, for the first time, poverty has stayed steady at the high water mark, for over 3 years in a row..
As soon as President’s Lyndon Baines Johnson’s War on Poverty took effect (50 years ago) child poverty declined until Reagan cut taxes in 1981… After he raised them back in a now famous agreement with Tip O’Neil, as the economy grew, childhood poverty fell. Again after Clinton raised taxes in 1993, the poverty level dropped over the rest of his term, until George Bush and the Republicnas cut taxes again… Since those taxes were cut, the childhood poverty level has risen to the record levels it is near today…. Tax Cuts have repercussions that extend far beyond the wealthy getting more money back in taxes. Higher tax rates boost the working economy; lower tax rates shred it……. 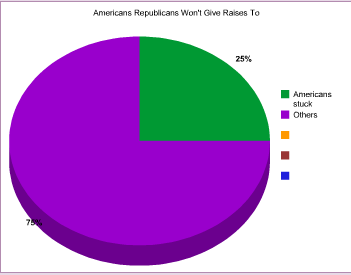 It is imperative that tax rates get raised as quickly as possible so this current plateau, the first 3 year one ever, the one created by the inaction of Congress because Republicans put the Tea party iin control of hte House…begins to drop down the other side. “‘Five years after excessive debt propelled a housing-market collapse into a financial crisis and recession, similar bets are being placed across the U.S”. In 2008, mutual funds held, on average, 17% of the bonds and 3% of the loans made to junk-grade companies, according to Bank of America. Today, they own about 26% of the bonds and 19% of the loans. For those that don’t do this all the time, here is how it works…. You buy $100 million dollars of stock X on margin… You pay 50% of the cost or $50 million, owing the remainder $50 million to your broker. The stock value rises to $150 million and you sell it…. You get the $150 million minus the $50 million owed back to your broker… You pocket an extra $50 million on the $50 million you invested… Your $50 million returned a 100% on your investment, congratulations…. This is why borrowing for stocks is up… Worse than it was in 2007-2008?…. Yes. Correct. Despite the Dodd-Frank bill, it is worse now, than in 2007-2008….. So then what happens if the price of stocks fall….. ??? You bought $100 million of stocks putting $50 million down and borrowing $50 million from your broker… Rule number one: you broker does not lose: you do…. Stocks fall 2%…. Your value is dropped to $98 million. You now owe the broker $2 million on top of the $50 you put down. Stocks fall again, 2%…. You value drops to $96 million. You know owe your broker an additional $2 million you put down… Getting scared? Sell at $96 million and by the time it goes through, you only get $95 million. Since you owed your broker $50 million and only get $45 million, you immediately cut him a check for $5 million dollars…. You originally put up $50 million so your investment cost you…. 10%…. If you paid cash and put the full $100 million up front, your loss to your company would have only been 5%…. So let us imagine this on the volume of the New York Stock Exchange… Where last Friday on the NYSE, $30 billion traded hands (positively for most, fortunately) … Assuming it was a bad day, and everyone was leveraged, on the minimal 5% drop outlined above, America would have to pay an minimal $1.5 billion to their brokers… In other words… Americans who leveraged, would be $1.5 billion poorer just from the NYSE one day drop alone…. At the 16,000 mark, a 5% drop means the DJIA would rest at 15,200…. or where it was back in the middle of this past October…. just 23 trading days ago….. Because of leveraging, that 5% drop means corporate America takes a 10% clip…. I don’t know if you’ve ever taken a loss of 10%, but if you haven’t… let me tell you… one does cut back on spending…. And that, is what makes this chart so scary………. Makes one understand now exactly why the market-rise continues despite the reality of our current economic situation, doesn’t it? 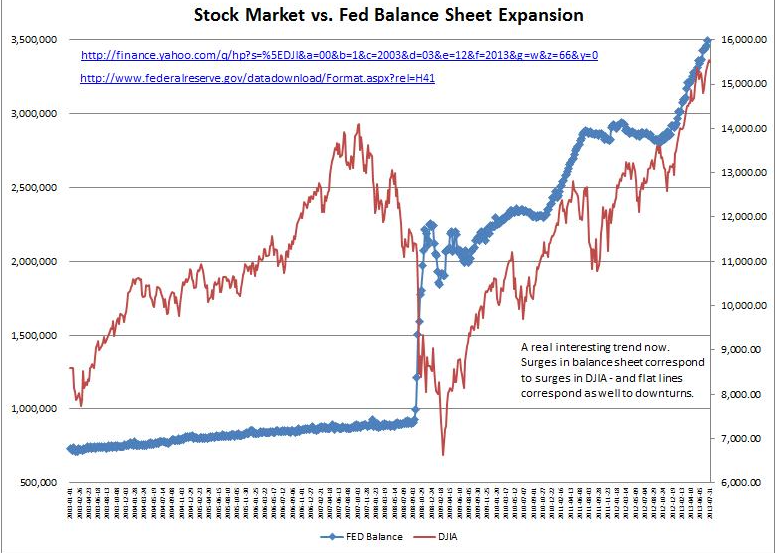 Now…..remember what happened when Bernacke said… “Well, eventually this easing will someday have to end.”? Quietly exit… slowly get off the ice so no one notices…. Just be totally off before all the cracking starts…. and the scrambling begins. Maybe you’ve heard, maybe you haven’t… But Democrats have allowed a SNAP cutback agreed with the Republicans at some point in the past, to go into effect…. John Carney is in agreement. Here is how that cutback will affect John Carney’s district, a district at large for the entire state of Delaware…. In Delaware there are 332,350 households. Of those, 36,382 receive snap benefits. Leaving 295,968 which do not. Of those 36,382 households, 26,763 are families. Of these families, 31% have two more more workers in the past 12 months. 50.1% of these families have one person working over the past 12 months. Only 17.7% fall in the category commonly associated with food stamps. people who are not working. The benefits will be cut $11 dollars per month per single person, maxing out at $36 dollars per month for families four and over…. Using the figures above, per month the 9619 individuals will cost Delaware $105,809 in less food purchased, and the 26,763 families will spend $963,468 less food dollars. These are rough estimates using the averages provided here. But these cuts mean that grocery stores across the state starting in November will receive $1 million less in sales for every month. Of course a year means that 12 million will not be entering the Delawarean economy per year. How does that affect the grocery business? There are 326 Grocery stores listed in Delaware. Although stores closer to areas that are less affluent will suffer worse, the average monthly loss to this slice of our economy per store is $3280 dollars. Each store over the course of a month will lose $3280 dollars. In a classic business structure, one expects to pay one third for product, one third for labor, and one third to everything else. If one profits, it is because one has beaten the odds in any of those three categories… Meaning that labor will be impacted by one third or $1100 each month…. Each of the grocery stores on average will need to cut $1100 each month… because of John Carney’s support of this piece of legislation. One can expect the entry positions to be cut first. Entry levels are minimum wage, but just for our calculations, let us go with $10 per hour. 100 hours can be expected to be cut…. or if not spread across the staff, their loss will cost the removal of 2 and a half workers from each of the 326 grocery stores in Delaware…..
Across the state that carries to 815 jobs…. So the cutting of SNAP benefits to appease Republicans appears to now cost Delaware an additional loss of 815 jobs…. According to August 2013’s figures, there are 51,200 Delawareans working in Delaware’s retail trade. 815 of those jobs disappearing is a 1.5% drop in that industry…. It is a small percentage of our total state workforce… 2 hundreths of one percent. As of August 2013, there were 30,658 Delawareans out of work… Add 815 and that new total, 31,473 jumps Delaware’s unemployment rate from its reported 6.9% up to our 7.1%…..
Now this does not account for 6 months later, when the impact of losing the cumulative of losing 1.1 million every month starts hitting farms. Nationally the drop is $5 billion. Simply put. $5 billion less in food will be purchased over the course of a year…. Product will be scaled back, and most likely so will the payments to farm workers. This too starts impacting the economy negatively….. The giant agribusiness, will be most affected. With fewer people buying their products, they must too cut back. So, once again, we have cutting back on a Federal program that directly subsidized farm production, impacting the single common denominator of every single citizen… Food. Like the floor of a skyscraper, once the first floor collapses onto the next, that one too gives out and drops downward as well, taking the next floor with it…. Most people don’t know how subsidies work; they never would complain about SNAP if they really knew.